KUWAIT, the world’s fourth largest oil producer with a current oil output capacity at 3.25 million barrels per day (mbpd) plans to invest $100 billion to expand its production capacity to 4 mbpd by 2020 and building floating LNG storage and regasification terminals off its Mina Al Ahmadi oil port. As part of the ambitious project is Kuwait National Petroleum Company’s (KNPC) investment of $35 billion in expansions and new projects in the coming five years, the company’s chief executive officer Mohammad Ghazi Al Mutairi says. “At the forefront of these projects came the multi-billion dollar clean fuel project, the new Al Zour refinery, the fifth natural gas plant and the construction of new liquefied natural gas import facilities,” Al Mutairi says. Al Mutairi underlines that the strategic projects will have great impact on Kuwait’s oil products competitiveness on the global market. “These projects would help Kuwaiti products enter new international markets thanks to its high quality and competitiveness and give a push to national economy and development in the country,” he says. KNPC has signed contracts for the $12 billion clean fuel project with three international consortia. The project aims at upgrading and expanding KNPC’s two refineries at Mina Abdulla and Mina Al Ahmadi. The project will transform the refineries into an integrated merchant refining complex that meets the requirements of the world oil market. It will also increase the refining capacity to 800,000 barrels per day (bpd). The new multi-billion dollar Al Zour refinery will be one of the largest oil refining plants worldwide. It will help supply low sulphur fuel (less than 1 per cent) to the local power plants. Meanwhile, Kuwait plans to award a 1.2 billion dinar ($4.3 billion) contract later this year for the first phase of a project to produce heavy oil at its northern Ratqa field, the head of state-owned Kuwait Oil Company (KOC) says. The project is part of efforts to meet Kuwait’s target of producing 4 mbpd by 2020. The deadline for bids for the engineering, procurement and construction (EPC) contract is May 11, but this may be extended if companies continue to have queries, KOC chief executive Hashem Hashem says. “This is (for) facilities needed to develop heavy oil, to be able to produce up to 60,000 (bpd),” he says of the planned first phase of the project at Kuwait’s northern Ratqa field. “All the international EPC contractors showed interest, and they are actively participating in this bid,” he says. KOC will spend about three months assessing the bids and award the contract by about October, he adds. The 60,000 bpd should be online by 2017 or 2018, he says. By 2020, the production should be 120,000 bpd and KOC will evaluate whether it needs to raise this to 270,000 bpd beyond that date, he says. Kuwait’s oil production comes mainly from a few mature fields, dominated by the huge Burgan field in the south of the country. Its current capacity is around 3.25 mbpd, with KOC’s share at around 3 mbpd, Hashem says. To bring the capacity up to 4 mbpd by 2020, KOC will contribute an extra 650,000 bpd, he says. “The growth of production is going to come from north Kuwait,” he says. Currently KOC is producing around 700,000 bpd there and will boost this by 300,000 bpd, he says. Hashem expects that Kuwait’s Jurassic gas field project, also in the north, would produce an associated 300,000-350,000 bpd of light oil. Kuwaiti heavy sour crude has historically been transported via oil tankers to refineries in Taiwan, South Korea, Japan and China. However, Kuwait replaced Iran as China’s leading government oil supplier after Iranian exports were restricted by US sanctions. The Kuwait Petroleum Corporation (KPC) even opened an office in Beijing to coordinate relationships with China’s major state owned oil refining, exploration and production companies. However, despite its long experience as an oil exporter and sovereign wealth fund innovator, (the KIA was the Arab world’s first SWF) Kuwait’s energy sector has suffered from the political gridlock between successive Kuwaiti Cabinets and its National Assembly. The $7 billion Project Kuwait designed to increase production in the emirates vast but mature northern oilfields has been beset by political and bureaucratic delays. However, Kuwait has now approved several innovative energy projects, including a South Korean built oil and gas gathering centre at the Sabriya oil and gas complex. Kuwait is also one of the Gulf’s leading gas producers and targets to produce one billion cubic feet of natural gas per day by 2015. Kuwaiti power generation/desalination plants and petrochemical industries require cheap gas feedstocks and consume more than the emirate currently produces, leading to a dependence on imported LNG from Shell and oil trading firm Vitol. Kuwait’s complex Jurassic Era oil and gas fields have necessitated reliance on oil majors like Shell and BP to explore new reservoirs in the desert and in the Partition Zone with Saudi Arabia. Kuwait’s Burgan is one of the greatest, biggest oilfields ever discovered in the Middle East, second only to Saudi Arabia’s Ghawar oilfield. 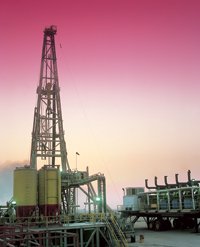 Burgan is a classic “elephant gusher”, to use the language of Texan oil drilling wildcatters. However, Burgan is now in decline and depletion ratios are accelerating. This makes investment in upstream, storage tanks and refineries essential. Kuwait holds six per cent of global oil reserves and has traditionally been an ally of Saudi Arabia and the UAE in Opec. This means Kuwait’s planned output hike would be derailed by the surge in Iraqi oil (and post sanction) Iranian exports. Another one million barrels of extra Kuwaiti oil exports could well mean an oil glut. The KPC is one of the world’s largest, integrated onshore and offshore state owned oil companies. Its subsidiaries Kuwait Foreign Petroleum Exploration Company (Kufpec) and Kuwait Oil Tanker Company (KOTC) are some of the most prominent players in the global oil trading, exploration and shipping markets. Kuwait Petroleum International (KPI) has stakes in foreign refineries everywhere from the North Sea to Vietnam, Pakistan to China. Al Mutairi says KNPC signed contracts with the three consortia led by Britain’s Petrofac, US Fluor and Japan’s JGC Corporation. Most of the other companies in the consortia are South Korean. Mutairi says the Al Zour Refinery project is due to be completed in early 2018. The cost of the venture – called the Clean Fuel Project – is more than $13 billion if smaller preparatory contracts are added, lower than the previous estimated cost of $16.4 billion, project manager Abdullah Al Ajmi says. The contracts, the first mega project in the Opec member’s vital oil sector for 25 years, will upgrade two of the three existing refineries by installing 37 advanced processing units that will reduce sulphur and carbon pollutants, Mutairi says. The current production capacity of the two refineries of Mina Al Ahmadi and Mina Abdullah is around 730,000 bpd, while the capacity of Kuwait’s third refinery at Shuaiba is 200,000 bpd. At the end of the project, the capacity of the two refineries will increase to 800,000 bpd, while Kuwait plans to shut the third refinery. KNPC has begun inviting bids for two of the five-package project to build a state-of-the-art refinery with a capacity of 615,000 bpd, project manager Khaled Al Awadhi says. The two tenders are for marine works and storage tanks. The company will tender the three main packages for building the body of the refinery, says Awadhi, adding that KNPC hopes to award all the five contracts in the first quarter of next year. The refinery, estimated to cost around $15 billion, is slated to come on stream in between the end of 2018 and the first quarter of 2019, Awadhi says. Kuwait’s refining capacity will reach over 1.4 mbpd from the current level of 930,000 bpd, when the projects are completed. Most of the production will be for export to Asian and European markets, he says. Meanwhile, Royal Dutch Shell and BP have signed deals to supply Kuwait with liquefied natural gas (LNG) over the next few years, a KPC official was quoted as saying. Kuwait began importing LNG in 2009 and signed deals for Shell and Swissbased trader Vitol to supply it during the peak power demand period from April to October over the last four summers. Jamal Al Loughani, deputy director of marketing at KPC, says that Shell and BP have been contracted to supply the Opec member country over the next 5-6 summers. He says the total volume of supercooled gas to be delivered between the two companies would be around 2.5 million tonnes a year. Kuwait will sign another contract to buy LNG from a third company, he says, without elaborating. Surging air conditioning demand in the hot Middle Eastern summer and a lack of domestic supply means Kuwait needs to import more gas each year to feed its power plants. Meanwhile, Kuwait has increased its oil production capacity to 3.3 mbpd and is hoping to reach 3.5 mbpd in 2015, the head of its state oil company says. Kuwaiti officials have previously said that capacity in the Opec member state was around 3.1-3.2 mbpd. “Kuwait has increased its production capacity to 3.3 mbpd. It will reach 3.5 mbpd by 2015,” KPC chief executive Nizar Al Adasani says. Kuwait hopes to reach 4 mbpd of capacity in 2020, despite slow progress in developing new projects. But Adsani says the Gulf state needed more help from abroad to achieve that target. “There is an urgent need to seek the assistance of foreign companies given the technologies and expertise that will contribute to the rationalisation of the use of the natural reserves we have,” he says. Kuwait will invite bids for a new multi-billion-dollar oil refinery as part of a drive to modernise the key sector, a top executive says. Meanwhile, KPI, an integrated downstream company which carries out refining and marketing of fuel, lubricants and other petroleum products, will see its investments in refinery projects in China and Vietnam expand its operations and ensure its growth in the international markets. However, increasing competition and volatility in fuel prices could hamper operational activities of the company. KPI’s core competences are marketing, research and refining of petroleum products. The company markets product through more than 4,400 retail outlets under its distinctive Q8 brand. It operates 24-hour unmanned service stations, known as F24 in Denmark, Q8 Easy in Belgium and Italy, and Tango in Netherlands. Its International Diesel Service (IDS) provides diesel to long distance haulers and international road transport companies through more than 600 outlets in Europe. Through its Q8Aviation division, it offers fuel to over 200 airlines across more than 60 airports in Europe, Middle East, Africa and the Far East. KPI has investments in fuel import facilities at Avonmouth in the UK, Le Havre in France and Rotterdam in the Netherlands. The company operates two refineries, namely, Milazzo (Sicily) and Europoort (the Netherlands). Under its Lubricants division, Q8Oils manufactures and markets over 1,600 industrial and automotive lubricants. It also operates four blending plants in Europe.